Heavy rains started to fall yesterday afternoon and it looks like there is a strong typhoon that hits our place and Metro Manila. I can see lots of people stopped in front of my store to cover and in no time the flood rises on the streets. Many got drenched and left stranded because jeepneys can't pass through our place because I heard that the flood is almost waist deep in low lying areas. Massive traffic led people to just walk and to become cranky. I myself was stuck in my store until 9:30pm because of heavy traffic and there's no more jeepneys passing by. Thankfully, my mom and BIL fetched me here at the store that's why I was able to come home. I really thought that I'll sleep here in my net cafe and I was already prepared for that. We arrived at home safely but and I found out that my mattress is kinda wet because of the small hole in my bedroom's roof but I have it fixed today though. My twitter friends and I have been discussing a lot of topics on Twitter for a while now and it serves as a good venue for us to share our thoughts as well. We are also there for each other to give support when someone is down or rejoicing over something. 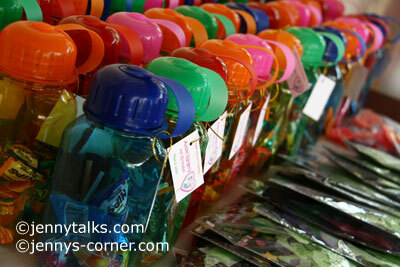 Our topics can vary from simple snack that we are having, to parenthood, relationships, shopping (!) and of course business ideas. If my memory serves me right, the topic on how to buy gold coins has never been discussed yet. I’m sure pretty soon it’ll be our topic since we all wanted to invest in something feasible. Online is the best place to find where to get some just in case we are ready to venture into that. Here's my new kit up for grabs at ARTSCOW. You need to be a member so you can use it for your digi-scrapping layouts. Sign up at ARTSCOW. It's FREE until June 26th only and after that it will be for sale already. Hey all, how's life treatin' you all? Father's day just passed and we just celebrated it simple by having a barbeque lunch at my brother's place. Nothing much going on aside from me being so busy designing kits once again. My mojo is overflowing and just so inspired lately that's why I'm taking advantage of it. Aside from giving me joy while designing, I will not the fact that I'm creating digi-kits for Artscow because I also love to win and get the cash prizes. The $20-$100 are not bad for kits made for a week, it's another income so I'm grabbing the opportunity. Last summer vacation, I usually stayed at home to do my online works there. I also had the time to do some house chores and do some cooking for dinner. 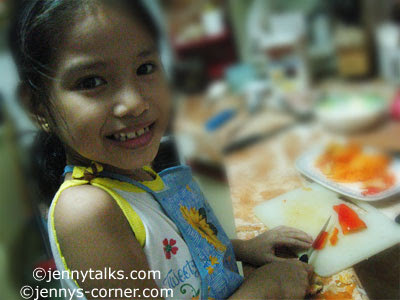 My niece Reign often sees me cutting veggies and cooking so every afternoon she usually come to our house and ask me if I'm going to cook already because she wanted to help. At first, I don't want her to help because she might cut her fingers but she's really persistent and really wanted to do it so I have no choice but to let her do it. I asked her to peel the carrots or potatoes and she enjoyed it. 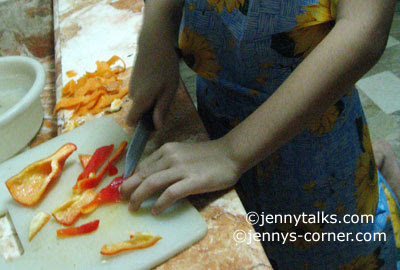 Later on I taught her to cut the bell peppers and looked she did well and she enjoyed it. This is a good training for her so that when she grows up she'll like cooking. 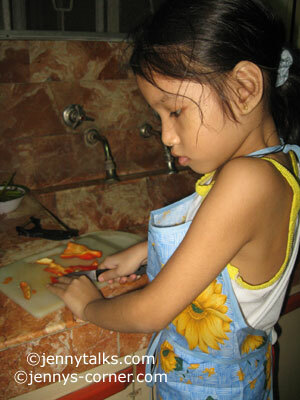 She even asked her mom to buy her an apron so she'll be a certified helper in the kitchen. Now that school is back, I'm sure she can only help me during weekends. My nephew Jerel who graduated from college this April already got a job. Good for him, eventhough he is not wearing a business attire with leather briefcase on his hands when he goes to work at least he's got a job quickly after graduated. He's now working in the advertising department of a quite big supermarket and I'm sure he can use use knowledge on his job. We've encouraged him to accept the job offer eventhough the salary is not that high and the work is actually the kind of work he wishes to do. We told him that he'll gain good experience from that work and if the time comes his contract finishes then he can apply at other company. It seems that our (second-hand) Toyota Lite Ace that we got September of last year is not on its tip-top shape. The aircon is almost busted, eventhough it is working it’s hardly cooling the inside of the van. The exterior look of the van is great and the walls of the van was still covered in plastic when we purchased it but it looks like the engine is not performing the way it should be. Oh well I think that’s what we got by buying a second hand van. Early morning tomorrow, bro will use it to fetch my sister and bro-inlaw at the airport that are going home bec. of a family emergency. Unfortunately like I’ve said the aircon is the problem so I guess they just need to bear the heat for a while until it is fixed. My mom has already expressed her wish that she wanted a new one, she likes a crosswind but I’m not sure if we’re all agreeing to that. All we wanted was a good vehicle this time with good engine and probably bro will have a customized billet grills, mug wheels and other accessories. Hope we can save a lot so we can purchase in no time. Look what popped in my screen? "Your battery needs to be replaced." Oh goodness, this is one alert that I don't want to see. I just bought my Dell laptop last June 2009 and it's only been a year and I already need to replace my battery? Wahhh.. what have I done wrong with my battery that it lost it's charging power too soon? I'm not quite sure if not draining all the battery's power and charging it when it is still 1/4 full is harmful to the battery? Is is better to drain the battery before charging it? Can you share how do you charge your laptop's batter? Yay, now I need to plug my laptop onto the electric so I can use it longer since the battery even it is full can only last for only 20-30 mins. Tsk tsk.. now i need to canvass how much a DELL battery is worth. Can We have Some Cool Weather Please? I had a very busy summer vacation not because I was out traveling or having fun with friends or family. I was busy with my (online) work that I had to stay at home most of the times so I can focus. It’s kinda boring at some point but it is one summer that I got to put much attention on my work. Anyway, I’m back with my old routine yesterday. School has started so I need to open my net café early and in no time students will be rushing to make their assignments by researching online. It was one hot day yesterday and it was made worst when a sudden burst of rain dropped early evening. The heat of the soil and pavement evaporated making the temperature mo re humid.. Argghh actually it was sticky and hot and it’s so uncomfortable. How’d I wish I can turn on the aircon but since I’m penny-pinching a little bit, I just used the ceiling fan to save on electricity. 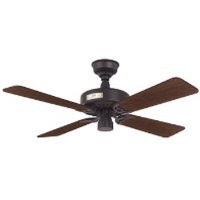 I guess all the Hunter Ceiling Fans that I see online can also cool off any room aside from giving it an aesthetic look. Happy Independence Day to all! 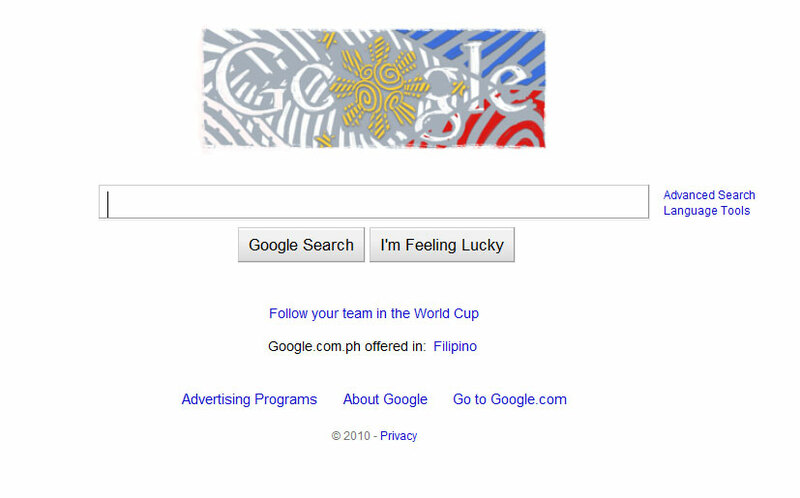 Today, June 12, 2010 is the 112th Philippine Independence Day. Since it falls on a Saturday so our Pres. made June 14 (Monday) a holiday so we'll have a long weekend. Our independence day was 1st declared on June 12, 1898. 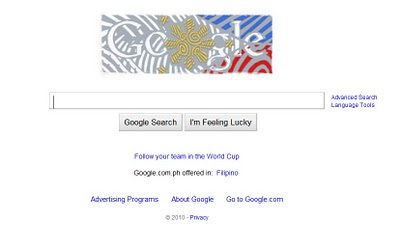 Look, I found that Google home page with independence day theme. It's back to school just like what I've said on my previous post. I'm sure most of the kids are happy to go back to school but for sure they'll be missing their summer vacation. My 7yr old niece is excited but kinda worried or little anxious about going to school on the 15th. She's a 1st grader now and that means new school, experience and new friends for her. I'm sure she'll adjust in no time. 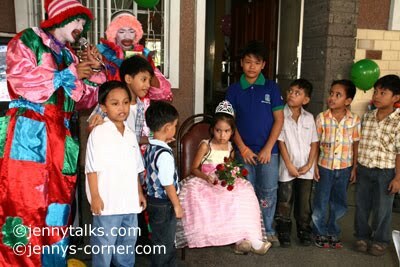 I have 2 nephews who'll be in 1st year in highschool and this time they'll have different school unlike when they're in elementary where they used to be classmates all the time. I'm telling them that highschool life is the most fun and most memorable days for me and I guess for many so they should enjoy it too. In no time after 4 years for sure they'll have to college courses and choose the career path that they want. I'm sure by that time, more universities will be opening and offering different degrees/courses. Wow, after 3 years, I finally designed digi-scrapping kit once again. Just in case you didn't know I was once a digi-scrapping kit designer for Scrapping Garden in 2007. The inspiration came back again when I learned that ARTSCOW, where I have my photobooks printed opened a Digital Scrapbooking Designer Kits Contest. I joined last 2 weeks ago and I entered my old kit there and I won 3rd place. This week, I'm joining once again and I entered this CHERISHED MEMORIES kit. 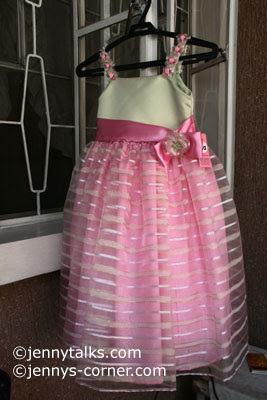 I'm also offering this for FREE for limited time only at Artscow so if you have an acct. there you can easily use it for free. You can add this beautiful digi kit for FREE at your Artscow acct. by clicking the ADD TO MY KITS button HERE. this will serve as your vote for me as well. Thanks. **If you still don't have an account at ARTSCOW, sign up HERE. Summer is finally over. Some students are back to school already this week but more schools will open by June 15th. I stayed at home working during summer and just let my SIL open and close my café for me. I will also go back to my old routine of going to my net café everyday and hoping the business will pick up once again when the school starts. 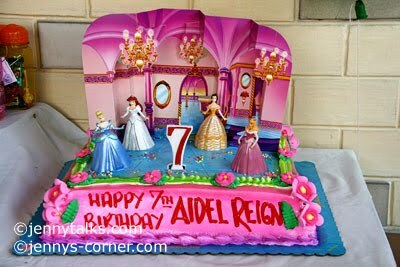 Since I became busy with my online business, I rarely accept desktop publishing orders like birthdays and wedding invitations at my store and I kinda miss doing that. I think I can still make business cards or simple birthday/baptismal invitations if I’m not too busy but with regards to wedding invites, I don’t think I’d still want to make some coz it’s a bit of a task to do. I’d rather spend my time working on my online works. So by Tues. of next week, I’ll be in my shop in the mornings till closing time in the evening. Yay, I know I’ll adjust once again bec. it will be noisy and there’ll lots of distractions unlike when I’m working at home. Our new President Elect Benigno "Noynoy" Aquino III and Vice-Pres. 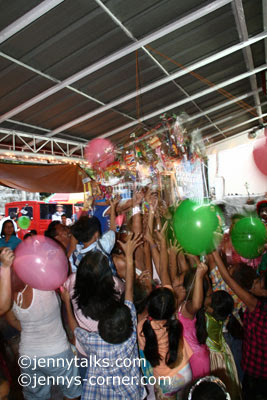 elect Jemomar "Jojo" Binay. ere proclaimed yesterday afternoon at the House of Congress. I was watching it live on TV and the place was jam-packed with their supporters who want to witness the most anticipated proclamation of our new leaders of the country. I think every one got surprised when Binay won because he is trailing behind in the surveys but hey look he emerged as the winner. Actually, I did not vote for both of them and I just hope they will keep their promises and will serve the people well and I know they can deliver that. My brother is collecting memorabilia as a hobby and business for many years now and he has this small gallery in their house where he keeps it. His collections include old LP records that he keeps for himself and also sells some to LP collectors. Aside from that he has vintage softrink bottles, old celebrity photos, coins and lots more. His collection sparks up a good conversation among our relatives, his friends and buyers. Someone even wants to buy gold eagle coins but unfortunately he doesn’t have one. I think bro should consider keeping some gold coins because for sure it’s a good investment. This is my niece Reign, preparing showing off and preparing her school stuff for the coming school opening this coming June 15th. 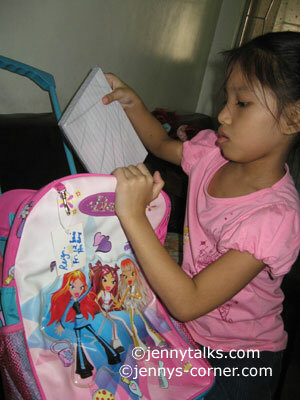 It was last Sunday when I bought her and her brother school supplies at National Bookstore. 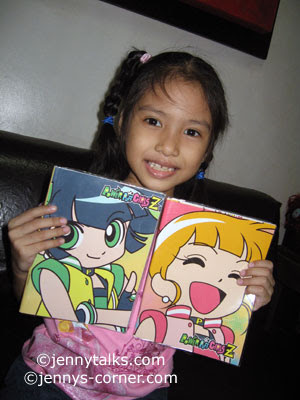 She loves Sakura but unfortunately who could not find a notebook with Sakura cartoons printed on them so she opt to buy the Power Puff and Barbie notebooks instead. She was so excited while we're buying things that right after we got home she asked her mom to get her Bratz bag (given my Aunt Beng few Christmas ago) so she can put her things inside already. She'll be grade 1 student already and she told me she's excited to be in a big school but quite scared because she has no friend yet. I know her parents will be up and about so early in the mornings because her class starts at 7am while her bro's class starts at 6 am. Hope they'll do good in school. It was about 12 midnight when I heard loud sirens of fire trucks passing by again and again about 2 weeks ago. I knew it was just near and we’re all stunned to know the next day that a big fire erupted at our town’s market. We are just about 5 minutes or few kilometers away and according to the reports, the fire engulfed 60% of the whole market and the most affected area is the dry goods section. It was so sad because the blaze happened when the market is closed already and the fire was too big already that’s why many business owners are helpless in saving their goods. If only it happened in the morning or during market hours, maybe more items for sale will saved. Unfortunately, I don’t think those businesses owners have any business insurance. It only shows that natural disaster can really happen any time and anywhere so we should be somewhat preferred. Business owners can opt to have their business insured and they can always find business insurance quotes online that they can peruse. Check out your local insurance company online just like if you’re in Texas area, this Texas business insurance can help you out. For those that needs other forms of insurance for their homes then check out this California home insurance , for we really never know when calamity will occur. We should always pray that we’ll all be safe. I don’t want to be so morbid but the huge sink hole in Guatemala really made me scared! This is actually a super late post but I'm still sharing it anyway. 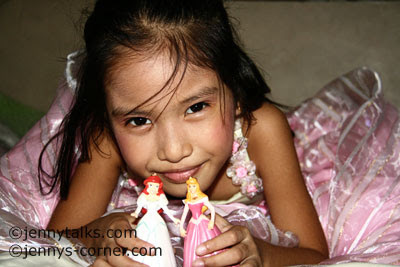 My niece Reign celebrated her 7th Birthday last May 2, 2010 and it was held at home. 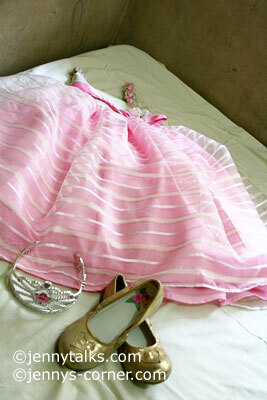 I helped my sister in law along with our relatives in the preparation of it. 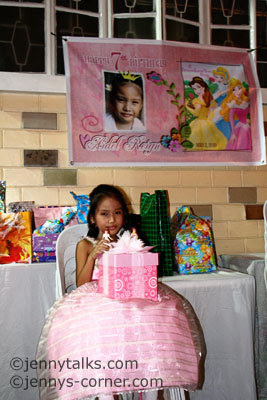 I made the layouts of the invitations and the tarpaulin while my SIL's, sister in law did the make up and the hair do. 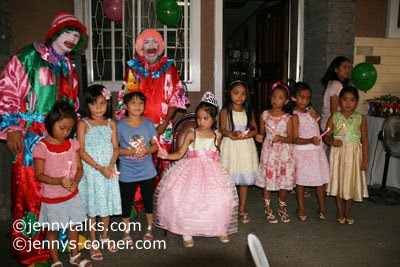 It was at 4 pm when the party started and the guests arrived one by one. 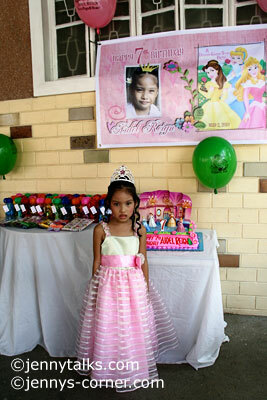 The theme of her party is Disney Princess. 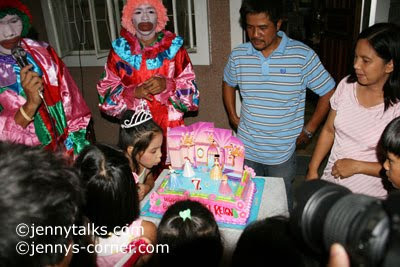 She was actually having tantrums during her birthday celebration because she didn't like the thought that she's going to dance during the 7 candles. 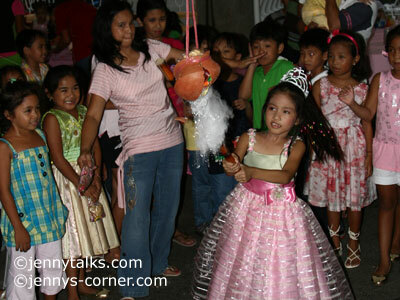 Later on as the party was going she did loosen up and we already saw her smile when the games started. 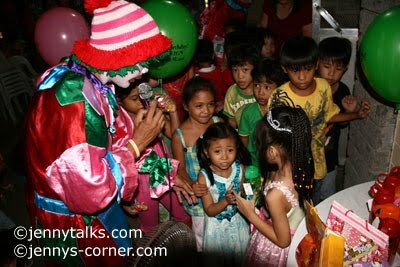 It was so fun, the clowns did a good job in the entertainment area. 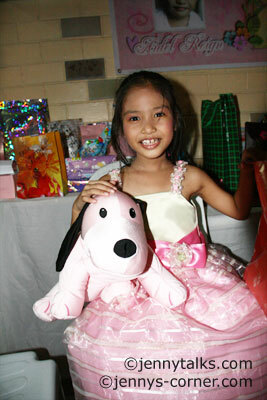 During the 7 gifts ceremony, most of the guests where her godmothers and me as an aunt. 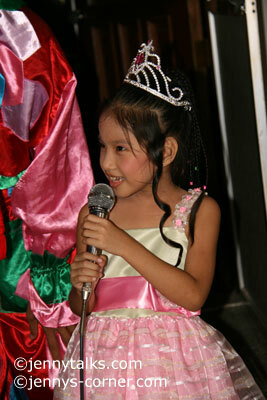 We gave her wishes and advices to her and I hope she'll remember all that. She's only 7 yrs. old but few more years she'll be a teenager already with teens problems like finding the best acne treatment and love solutions.. yay! Anyway, I became the photographer during the party but 2 of niece and nephew where also taking shots with their own DLSR. 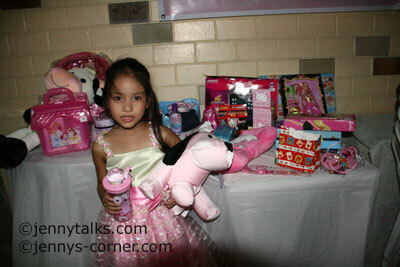 Reign was all smiles already during the opening gifts after the party because she received lots of nice stuff like Barbie items, dolls, and lots more.